Gov. Larry Hogan announces a new nine-member commission tasked with creating congressional districts by March. 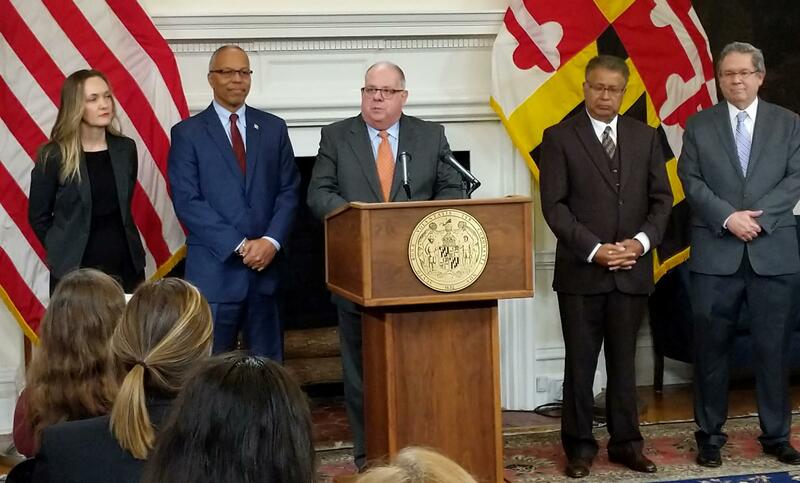 At a news conference Monday, Hogan said that timeline necessitates moving forward without the General Assembly’s input. He said he also plans to introduce legislation in January creating a new redistricting process to be used going forward. He has tried unsuccessfully to pass the same bill for a few years. But he said if the General Assembly approves the measure quickly this time, the state could use that new process to draw the sixth district now. Meanwhile, the court’s ruling is temporarily on hold pending the results of an appeal by Attorney General Brian Frosh. Frosh’s office declined to comment. Redistricting reform is among Gov. Larry Hogan’s priority issues. On numerous occasions, he has called for a nonpartisan process for redrawing the state’s congressional districts, which he says are some of the most gerrymandered in the country. But at a press conference Monday afternoon, he said the bill the General Assembly passed this year is not what he had in mind. Joel McCord and Rachel Baye, WYPR's state government reporter, talk about Maryland Democrats' efforts to capitalize on public sentiment for redistricting reform. And about how it's going nowhere.